I really had no intention of writing a new post today. I have been away from home quite a bit, and the few days I have had at home, I have been working on “perfecting” (hopefully) a muslin for my wrap dress. 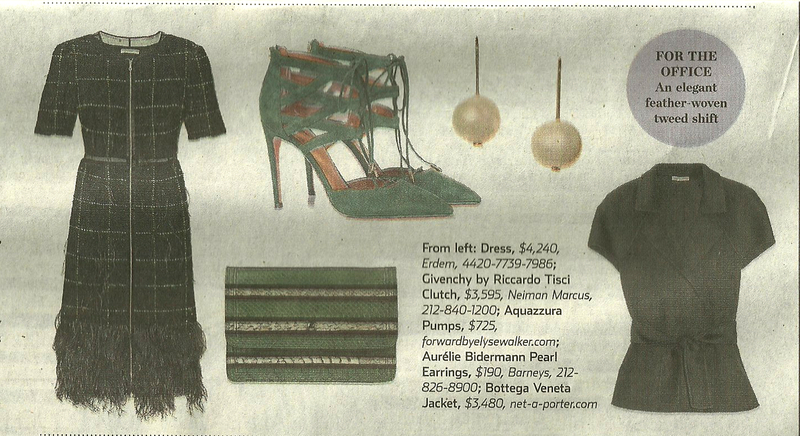 But – I was inspired yesterday when I read the fashion section of the Weekend Wall Street Journal. Meenal Mistry devoted her front-page article to Fall’s “feathered looks” which range from casual to office to evening attire. This was the only excuse I needed to join the feather frenzy. The dress on the left features feathers at the hem. I’m not sure I’d wear feathers to an office (if I went to an office! ), but I love the dress. This is a handy little chart to the season’s most popular fashion feathers. Princess seaming and the use of few darts insure that the long fluid lines of the low-backed dress and the evening coat are unencumbered with excess fabric. The ostrich feather trim is attached to the coat in three evenly spaced rows at both the neck and hem. 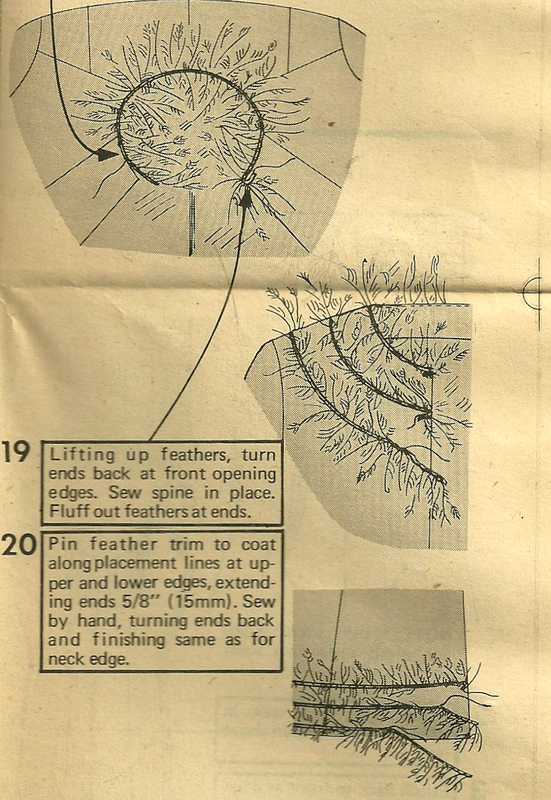 The knee-length coat could certainly sport feathers at least at the hem line, don’t you think? I did a lot of “pattern dreaming” during the decade of the 1970s. 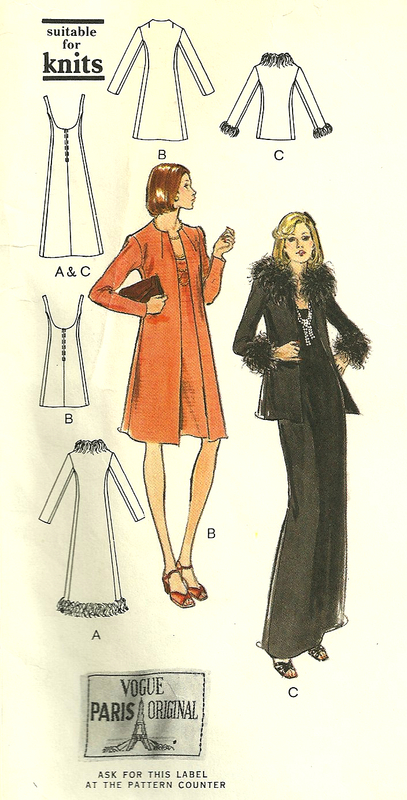 I apparently never had an occasion to make this dress and coat, as I never purchased it when it was available in the pattern catalogs. But I did, indeed, dream about it – many times. When I found it again – in my size, in factory folds, with label intact – in an Etsy store a while ago, I indulged that dream – and I bought it. Will I ever make it? The dress, probably “no” unless I alter it to show a little less skin! 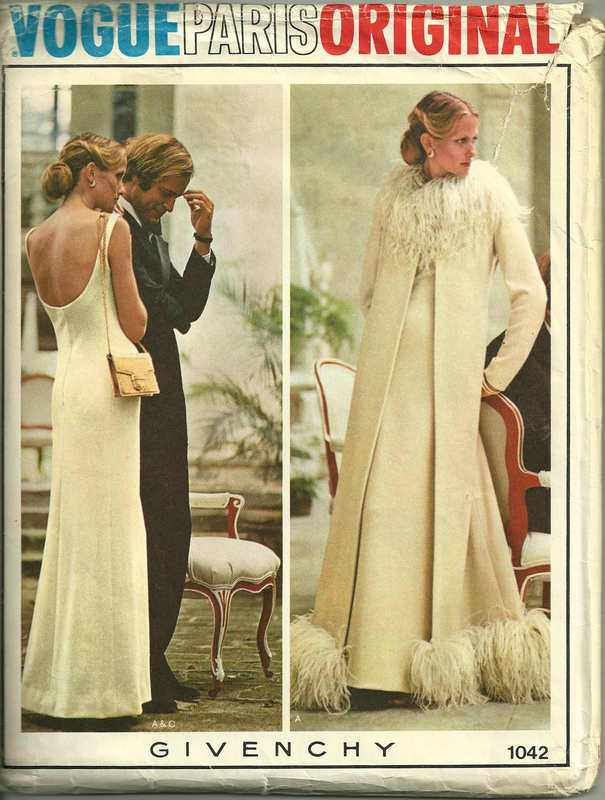 But the coat – if the occasion is special and worthy of this level of simple elegance – then “yes”. And – I’ll definitely be using feathers. Fun pattern! I’m not sure I’m the feather wearing type, but I love the old Hollywood feel of feathers! I worked at the fabric store this past weekend and noticed that we got some new feathered fabrics in. One of them would have been perfect when I was making my sister’s wedding dress because I covered her train in feathers back in 2004. All of a sudden I am seeing lots of printed feathered fabrics. I think I’d only wear feathers for some very special occasion – like a wedding or some very fancy event! Oh, that evening coat is stunning! Quite the wow piece if you’ve got somewhere to wear it! Yes, that’s all I need – someplace to wear it! Have pattern – Need event! The Givenchy coat with ostrich feather trim is exquisite. If I should ever find myself on a red carpet, I would want that on my body! Your stash of vintage patterns brings back so many memories of sitting at the pattern counter with my mother in the early 70’s looking through the books and dreaming. What treasures we tossed out with the trash over the years… sigh. I, too, threw out more patterns than I care to remember. I’m so grateful for the ones I did save – and, of course, I’m so happy that so many are now available over the web. So many of them bring back memories for me, too – I can actually remember sitting in the fabric stores, at the pattern counters, deciding what to buy!